Windows 10 Fall Creators Update is right around the corner and Microsoft has been pushing Windows Insider previews at a faster clip for the last few weeks in preparation. But its engineering team is not standing still, having already started work on the “Redstone 4” (RS4) update that should arrive in spring 2018. On Thursday, Microsoft released a preview as part of its Windows Insider Skip Ahead program, while taking the opportunity to explain more about how that program works. 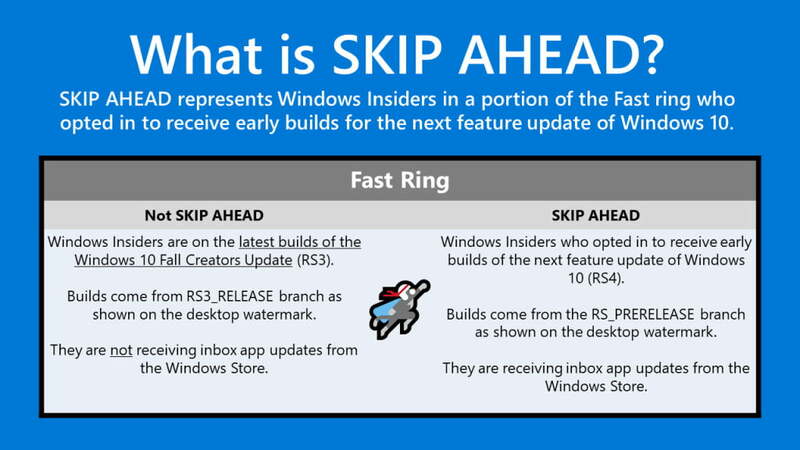 The company introduced Skip Ahead in July as a way for Windows Insiders in the Fast Ring to start receiving features and functionality that will be coming after Fall Creators Update is released. That prompted some questions from Insiders about how the program works. Thursday’s Windows Insider build 16353 is the first that is not identical to the one released to normal Fast ring members and Microsoft wants to be sure that everyone understands how Skip Ahead works. Note that once Microsoft releases Fall Creators Update, then every Windows Insider will be back to receiving the same RS4 builds. Presumably, Skip Ahead will pick back up when RS4 is ready to be released. As far as build 16353 goes, the changes are minimal. That is to be expected, given that work has just begun on RS4. There are some updates to the Action Center, including a two finger gesture to dismiss all notifications and various bug fixes including a resolution to some display issues. If you are in the Skip Ahead program, then you will notice little difference from the last Windows Insider preview build.